Are abortion clinics really clean and safe? One infamous abortion clinic in Rockford Illinois (the Northern Illinois Womens Center) is the epitome of this. 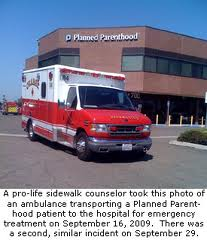 Copy and paste to your Internet http://prolifecorner.com/node/862 to read comments by a local pro-Life group. Abortion advocates have long espoused that abortion must be easily available to provide women with "safe, legal abortions". After abortion became legal, unsanitary back alley abortionists simply moved to main street into plain view and now feign respectability. If you copy and paste http://www.lifedynamics.com/Pro-life_Group/Pro-choice_Women/ and click on the Blackmun Wall link you will see a litany of women who have died by the supposedly "safe legal abortions" in America since Roe v. Wade. My wife worked directly across the street from a Canadian abortion clinic. She often saw ambulances pulling up to the facility to rush women from the abortion clinic to a hospital. Safe abortions? Of course this was never reported by the press. Was/is such consistent silence a wilful act by an abortion friendly press to perpetuate the myth that abortions are safe? The media are always quick to deny bias but the public is left to wonder? The advent of new social media has broken the grip traditional media have now on what is reported and not reported, and how things are presented. A number of years ago, a timid OBGYN told me quietly that after the only abortion clinic was introduced into the Canadian city where he worked the number of women with perforated uteruses, and other complications from abortions, arriving in hospital emergency wards from the abortion clinic skyrocketed. Again, that was never reported and my timid gynecologist friend would never say such a thing publicly for fear of media criticism. He had a thriving medical practice to protect. Poor man. His spine was so thin you could pass your hand through it -- but his wallet was so thick he sat crooked. The pro-Life cause is winning! I want to bring your attention to the good news story above. Pro-Life advocates should take heart that the public is becoming more and more pro-Life. No longer can abortion proponents claim that the majority of people are "pro-choice". For decades Life advocates fought against the grain of public opinion and media bias for abortion. Like trying to change course of a giant ship, the shift of national opinion has been slow, but with persistent commitment to the universal right to life from conception to natural death, dedicated pro-Life people are now seeing the fruits of their labours: Most people do not agree with the current status quo of abortion on demand (and in Canada, taxpayer abortion on demand!). We are winning the battle of hearts and minds. Don't stop now! Keep up the good fight for full inclusion and protection of every life regardless of its state or stage in the life spectrum. We have science, logic and truth about prenatal life on our side. Abortion advocates must rely on power seized through ideology, sophistry, bigotry and old slogans. 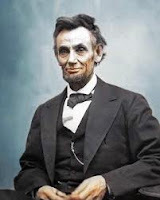 I am reminded of the words of Abraham Lincoln about another great battle for human equality: "We will win more converts each day. We will grow strong by the violence of our adversaries and unless truth be a mockery and justice a hollow lie, we will be in the majority." Do not grow weary, dear friends in the great pro-Life cause. The struggle to stop the abortion holocaust and give legal recognition and protection to prenatal life is the greatest civil rights issue of the 21st Century and you are winning! Promoters of abortion must rely on deception and outright lies in order to promote their agenda. Life developing in the womb is as human as you or me and in begins at the point when sperm fertilizes egg. This is not a matter of opinion, it is plain biological fact. The humanity of the prenatal child is increasingly difficult to deny as embryology, fetology, the technology such as ultrasound imaging improves. 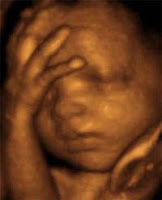 The image to the left is a 3D ultrasound image of an unborn child. The ethical poverty of the abortion movement is illustrated best by its proponents. The first hint is their language beginning with the phrase "I'm pro-choice" -- yet not saying what is the choice. It is my experience that if you press them to fully identify the choice they are apt to become angry and abusive. In its bluntest terms, they believe that parents should be able to choose death for their unborn child by means of abortion regardless of how uninformed that decision may be. In the city of Rockford, Illinois, apparently supporters of abortion do not believe in informed choice. They tried by every means possible to stop a free mobile ultrasound service to be offered to abortion minded women to see their child before going through with abortion. Ultrasound staff provide women with accurate information about prenatal development and resources available to them should they choose to complete her pregnancy. That's providing women with information needed to make informed choices. Apparently that's not the choice "pro-choicer" in Rockford Illinois have in mind. They abuse, threaten, and behave in the most hateful ways toward Rockford citizens who try to offer women alternatives to abortion. But pictures are better than words. Go to http://prolifecorner.com/node/845 to see the sort of harrassment Rockford's abortion proponents use to stop alternatives being offered to women in crisis pregnancies. They are not "pro-choice" they are "pro-abortion" and anti-alternatives. Notice that one sign by abortion supporter tries to scare women away from the ultrasound van by saying a woman was raped in it. That is a vicious lie. 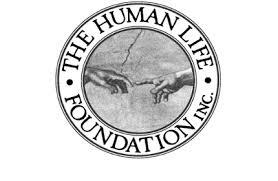 As of today's date, the HumanLifeMatters' blog has had 28,416 hits. In descending order they come from the United States, Canada, Ukraine, Russia, the Netherlands, Germany, the United Kingdom, China, Poland, Argentina, Australia, Iran and Latvia. If anybody is interested in contributing a column about Life issues or bioethics, send it to Mark Pickup (MPickup@shaw.ca)as a Word file attachment. I can not pay for it, but if published you are assured of a wide readership. I have talked to physicians who practised medicine during that time. They could not remember any request for abortion ever being denied under Canada’s liberal abortion law passed in 1969. As far as they were concerned the law was so bad it may as well not have existed. In 1988, the Supreme Court of Canada struck down that law. Abortion advocates of the 1960s said that easy access to abortion would eliminate child abuse because only wanted children would be born. They were wrong on that point too. 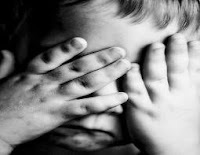 Canada has been aborting children all day long for more than forty years and yet the rates of child abuse have skyrocketed! We have the worst of both worlds. The assertions made by proponents of abortion were not based on empirical scientific evidence ― they were based on ideology and social agendas. Abortion does not stop child abuse, abortion is child abuse! The British Columbia Civil Liberties Association has launched a legal challenge with the B.C. 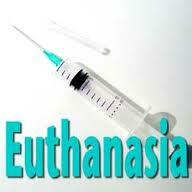 Supreme Court against Canada’s laws prohibiting assisted suicide and euthanasia. They are representing the family of Kay Carter who went to Switzerland for an assisted suicide and Kelowna resident Gloria Taylor who suffers from Lou Gehrig’s disease. The latter case is strategic because Taylor is not expected to live long. The B.C. Civil Liberties Association wants her case fast-tracked through the courts. There’s more than one way to achieve what advocates of euthanasia and assisted suicide want. If democracy doesn’t work in their favour, they will try to force the issue through the courts. One thing you have to give to euthanasia advocates -- they are persistent. Abortion and euthanasia are indeed aberrations from the course of history and we are paying a heavy cost. The cost will get higher and, as always, will be paid with human blood.